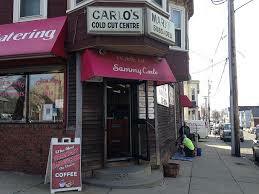 Carlo’s Catering services has been at the corner of Bennington and Moore St. East Boston, MA for over 30 years. Before this location my dad, Sammy, had been just one block up the street on the corner of Bennington and Byron St. along with my mom Carmela. With hard work and dedication, my parents continued to enhance the family business that my grandfather and founder of Carlo‘s Carmelo, had started. Every product we provide to our customers carries with it my grandparent' s innovation, my parent’s persistence and my responsibility and dedication to hold firmly to the values of a business to serve its community, as best as we can.